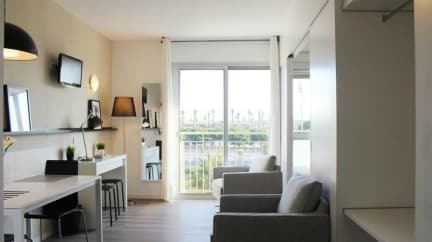 This student residence is located on the Campus del Mar of the Pompeu Fabra University, a 3 minute walk from Barceloneta Beach. 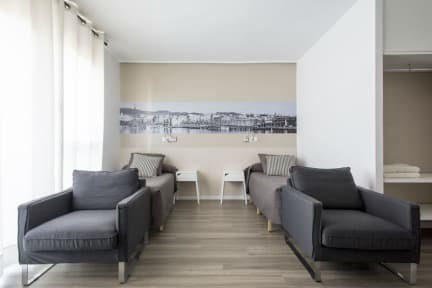 It offers single, double and family studios equipped with a kitchenette and a private bathroom. All of them have free Wi-Fi connection. Most of double and family studios have a flat-screen TV, daily cleaning service and free breakfast service. If the rate includes the breakfast service, a breakfast tray is placed in rooms the night before. There is also a range of vending machines. The Campus del Mar Residence Hall has a fitness center, a TV room, a games room equipped with a pool table and several lounge areas. There are a private parking, self-service laundry and 24-hour reception. The Paseo Marítimo and the Olympic Harbor are within a 2-minute walk from the Campus del Mar Residence Hall. Barceloneta Metro Station is 250 meters away. This residence is open to the university community all year round. It offers accommodation to all members of the Educational or University Community (students, professors, researchers, administrative staff, etc.) to those participating in academic and scientific congresses, cultural and sports groups; and holders of an international student card or similar.